Climate : Pleasant during day, cold at night. Clothing : Heavy woollens throughout the season. Air : Nearest airport is Jolly Grant, Dehradun, 17 km from Rishikesh and 265 km from Gangotri. Rail : Nearest railhead is at Rishikesh, 248 km away. Road : Gangotri is connected by road with Rishikesh, at 265 km away. Garhwal Mandal Vikas Nigam organises different package tours through 2X2 dlx / coach and other cab tours, other bus services are available - Samyukt Rotation Yatayat Vyawastha Samiti connect Gangotri with many centres in the region like Haridwar, Rishikesh, Tehri, Uttarkashi etc.. 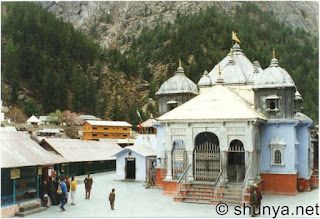 The revered shrine of Gangotri is one of the most important pilgrimages for the devout Hindu. 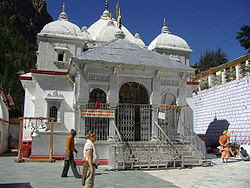 The Gangotri temple was constructed in the early 18th century by a Gorkha Commander Amar Sigh Thapa. The existing temple is said to be the one reconstructed by the Jaipur dynasty. Every year thousands of pilgrims through the sacred shrine between May & October. The Pujaris & brahmins are from the village of Mukhwa. 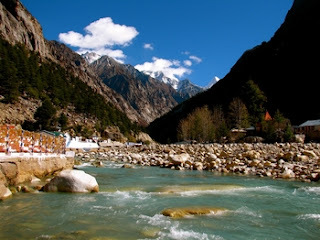 The water from Gangotri is carried to offer to Lord Shiva. It is believed that this water has amrit (nectar) in it and will soothe the throat of Shiva who gulp the poison. The Shrine of Gangotri opens during the last week of April or the first week of May, on the auspicious day of Akshaya Tritiya. The temples opening is preceded by a special Puja of Ganga both inside the temple as well as on the river bank. The temple closes on the day of Diwali followed by a formal closing ceremony amidst a row of oil lamps. It is believed that the Goddess retreats to Mukhwa, her winter abode (12 km downstream).